It's my baby's fifth birthday today (because as I'm posting this it is still technically Thursday). He woke up this morning, looked himself up and down and then looked at me with big brown sad eyes and questioned in a disappointing voice. "Mama, Why am I not any bigger?" I'm not exactly sure if my answer was what he wanted to hear. "Baby, you are one year older. But... I think you might be bigger." He stomped off and mumbled something like "I wanted to be big like Cole." Ahh, to think that being one year old meant being a foot taller... And just now he told me after I asked him how his birthday was: "I've waited years for my birthday to come!" The newest CAS-ual Fridays Challenge does have to do with the card! 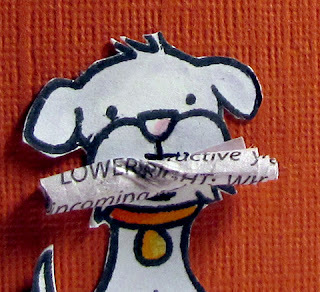 The challenge this week is to Get Loopy and use a ribbon tab or loop on your project. We were supplied with some Halloween ribbon by this week's sponsor, The Ribbon Carousel. I used the ribbons as an accent for a graduation card-Tiger Country over here with the local high schools so I'm set for June! To check out some really fabulous creations by the Girl Fridays, read additional details about the challenge and rule and find out more on our sponsor, head on over the CAS-ual Fridays blog! 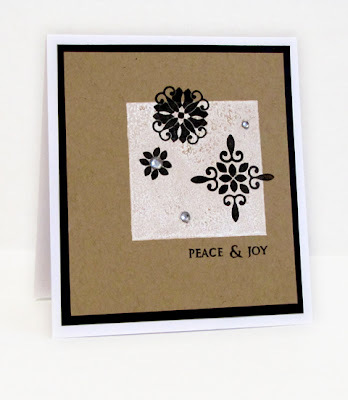 Today is a Carbon Copy day and Lora from Fluer de Lo is joining me in using Wplus9's Poinsettia Patterns for an entry into Yvonne's Guest Designer Challenge: Clear Block Stamping with Piali Biwas. 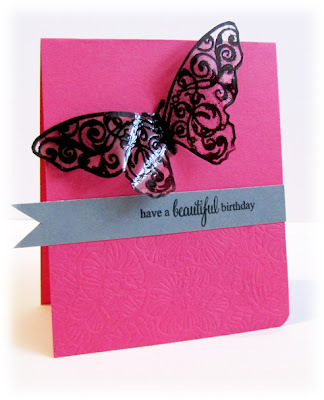 Lora has an exceptional writing ability and her cards are purely clean and simply gorgeous. 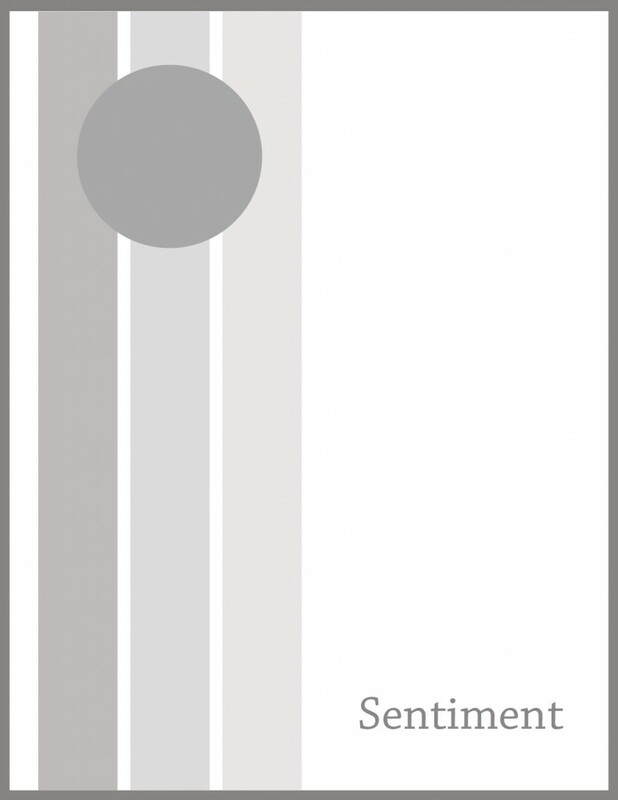 My card today is another attempt at a modern design with it's off center stamping, clean lines and fresh color combination. In this card, I took creative liberties and used the poinsettias and rhinestones to represent snowflakes. Gotta love creative liberty! 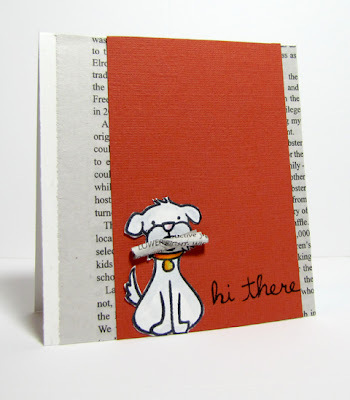 Please hop on over to Lora's blog to check out her take! I welcomed packing up my crafty space for this past weekend in order for my sister to have a place to set her things and sleep. This included dismantling my normal photographing set-up, so I ventured out in the great outdoors for a picture. Finding a place that wasn't covered with dew proved near impossible but this tree stump did just fine and kind of lends itself to the overall design of the card. Skipping Stones Design Sketch Challenge #95 features a fantastic sketch from Amy. Of note, I distressed a plain white die cut to match the patterned paper and stamped the beautiful little bird from Heartsong and a sentiment from Always Here. 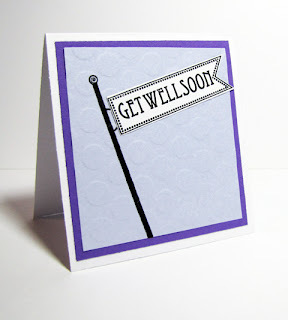 Please check out the guest design and design team samples and get more details over on the Skipping Stones Design blog, and link up your take for a chance to win a really great prize! 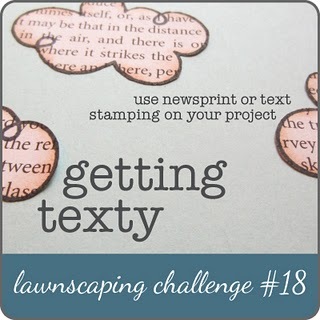 Sneaking in to post this idea I had for the current Lawnscaping Challenge: Getting Texty. My sisters were here this past weekend and we reminisced a lot, still doing so myself after they've left. An image of our old black lab fetching the newspaper for my dad on a cold winter morning popped into my head and I had to replicate the memory (insert small cute white dog in place of handsome large black dog as it was easier to color!). 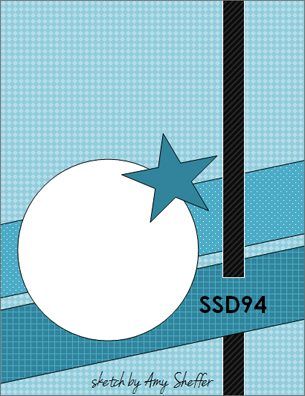 There is only a strip of the white cardstock base showing on the left side of the card on purpose, I wanted the overall feel to be fun and cute, but modern and graphic. 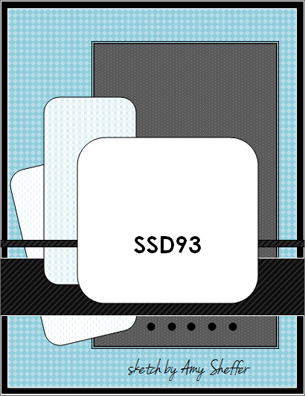 Memories are the driving force behind most of my cards, what is yours? 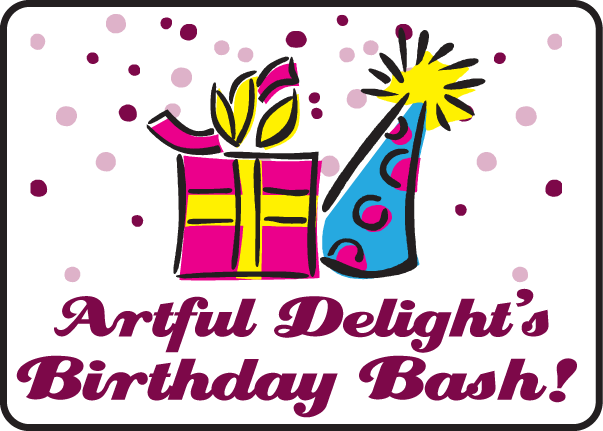 I'm thrilled to participate in Artful Delight's Birthday Bash! If you are following the hop in order, you should have arrived from June's blog. 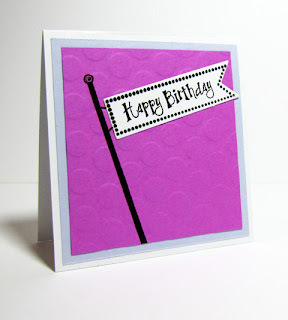 Today marks the second day of celebration in honor of Leeanne's own birthday, the mastermind and talented individual behind Artful Delight and delightful monthly scrapbook and card kits. I've "known" Leeanne for a while now, and had the chance to design a blog header and badges for her and am so honored to help spread the word about her Birthday Bash! 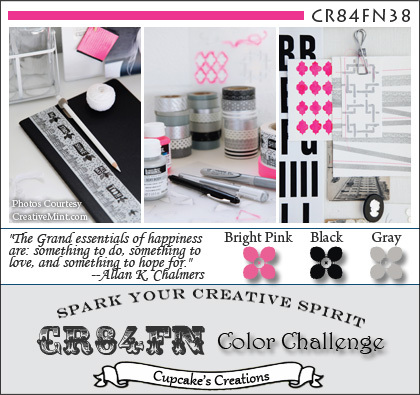 There is a super challenge going on right now to win a chance at a six-month free subscription to Artful Delight's Monthly Custom Kits, something you don't want to miss out on, seriously, that is huge!! If you missed the first day of the hop or would like more details on the challenges through tomorrow, head on over to Artful Delight! 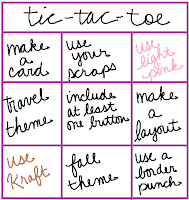 Today's challenge is a tic-tac-toe board. 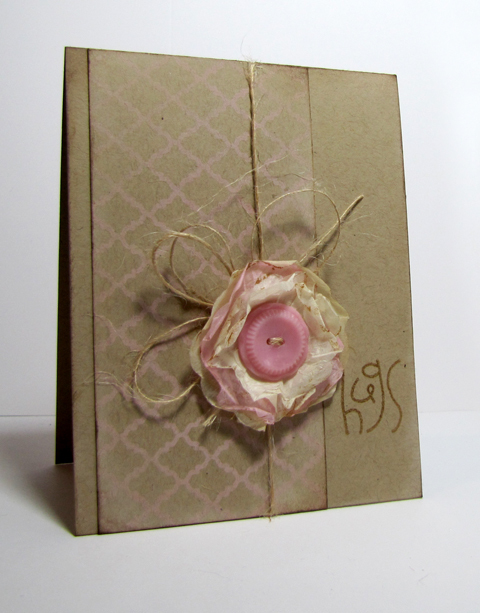 I chose to work with kraft, light pink and I also used a button in the beautiful bloom from a friend. Also, Leeanne is offering up super savings for one week (ends 09/30/11), a perfect time to purchase an Artful Delight Subscription through a pre-pay kit at 34%, in honor of her birthday age! 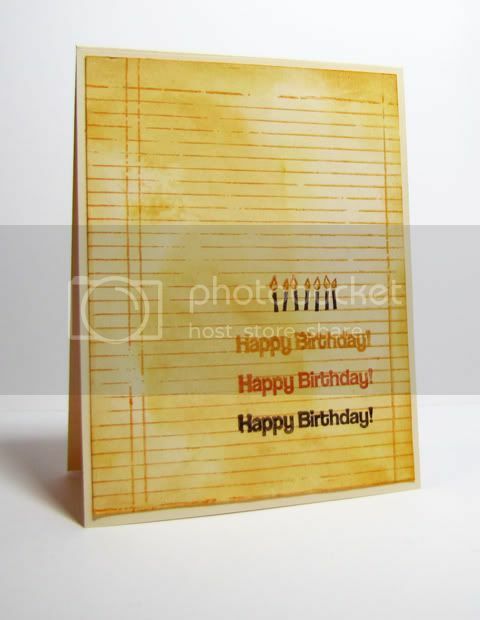 Simply use the coupon code BDAYBASH during your checkout. Every month kit is custom, and features some of the newest products out there! You can also save 15% off your order - minimum purchase $23.00 ----Enter code BDAYBASH15 at checkout to receive your discount. Details are here! Your next stop is Julie! 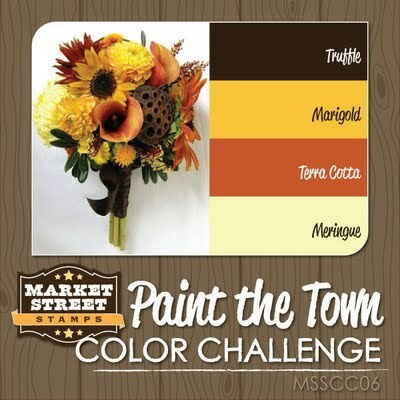 For complete details and for a list of all participant's, stop on over to the Artful Delight blog. 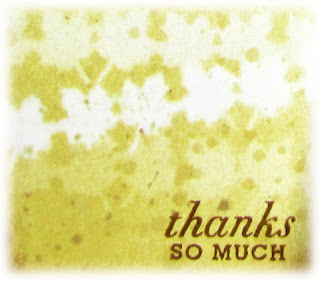 *Enabling Hint* Comment on as many blogs in the hop as you can because random commenters will be chosen to win a prize! CAS-ual Fridays has a really great challenge this week: Create a clean and simple project using at least 3 shades of a monochromatic color of your choice plus brown. We have a fantastic sponsor, Stmapotique Originals. 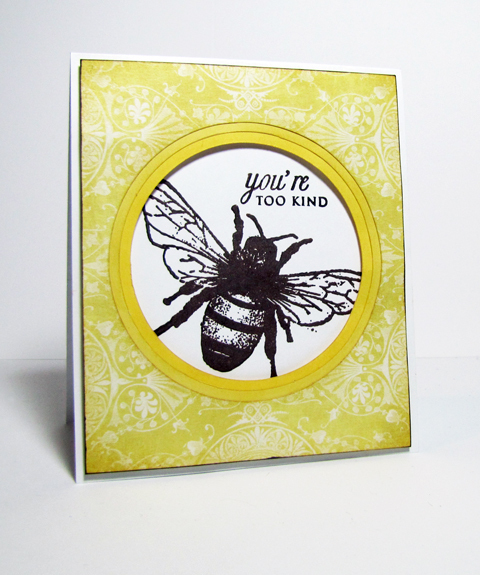 I stamped the Big Bee from Stampotique and a sentiment on a white cardstock base. 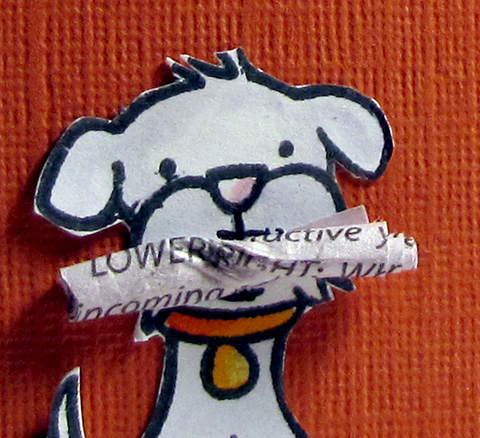 The other layers were glued onto each other and then popped up with dimensional adhesive. 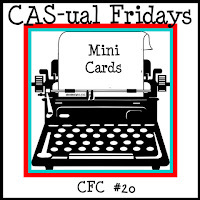 As always, I invite you to please check out the CAS-ual Fridays blog for additional challenge details, read more about the sponsor and rules and see some fabulous designs by the Girl Fridays! May Arts has teamed up with Tattered Angels this week! I've got a tutorial up today that showcases a way to get more out of your ribbon-please stop on over and leave a comment! 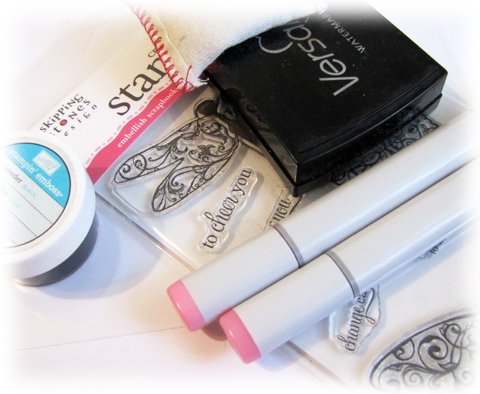 May Arts and Tattered Angels products! 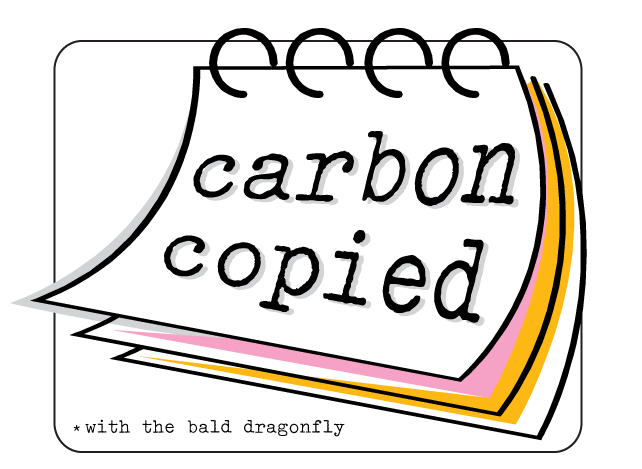 Heather I., from Come on get Scrappy, and I are teaming up on this fine day for a Carbon Copied post! 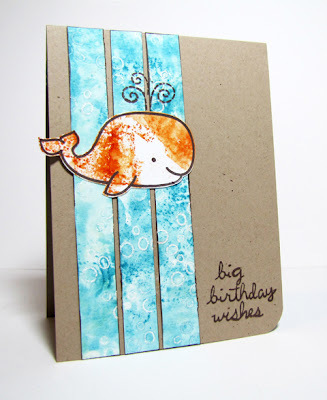 We are featuring Critters in the Sea and Sophie's Sentiments by Lawn Fawn. 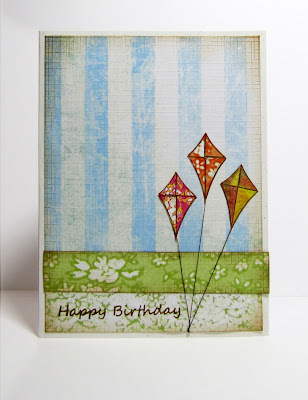 Our challenges of choice are: Wee Memoreis-to not use any patterned paper and the sketch challenge over at Lily Pad Cards. 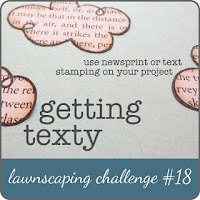 Heather is a whiz when it comes to thinking up creative ways to use Lawn Fawn stamps, she's downright creative and so talented! 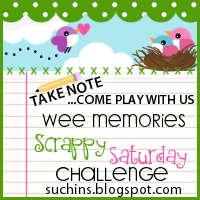 Please visit Come on get Scrappy and see her take! has "BOO"ed you with Halloween cheer. add fun & treats, and goodies will do. keep your "Boo"ing a secret, that's the trick. Such a cute little saying... My boys will get a kick out of it this year. I totally simplified the Skipping Stones Design Sketch and it is flipped 180 degrees. 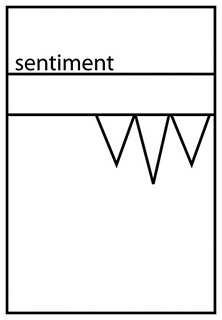 I took a cue from one of the Guest Designers this month, the ever so talented and always inspiring Cristina, and replaced scored lines for some of the panels from the sketch. The ghost was made using the same tips and tricks from this post. 1. Happy that the heavy rain outside hasn't turned over to snow yet. Hoping that it holds out until at least mid-October. Please, Mr. Weatherman? 2. Happy that I'll get to spend time with my two sisters, my brother-and-law and my sweet baby nephew soon, very soon. Gotta be honest, hoping that the stranger anxiety that the little boy is starting to experience might be a little bit lessened (since I kind of look and sound like his mama?) and he'll let me hold him as much as he can stand. 3. Happy that the husband volunteered to take the boys so I could have some "quiet time" this morning. Quiet time equals productive time. 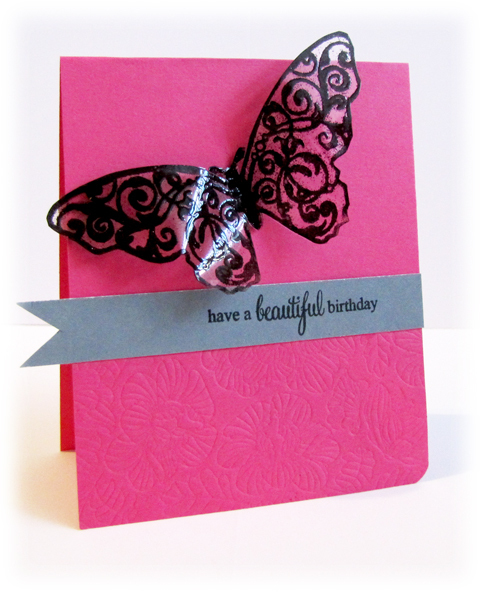 I love to make cards without patterned paper too, it is challenging but I usually like the end result. 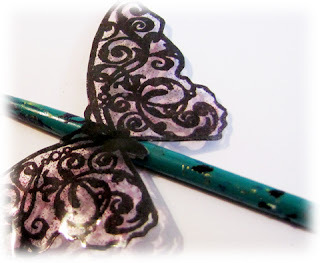 Making your own patterned paper is fufilling, I wish I could design a line of patterned paper off of making my own with inks and such. 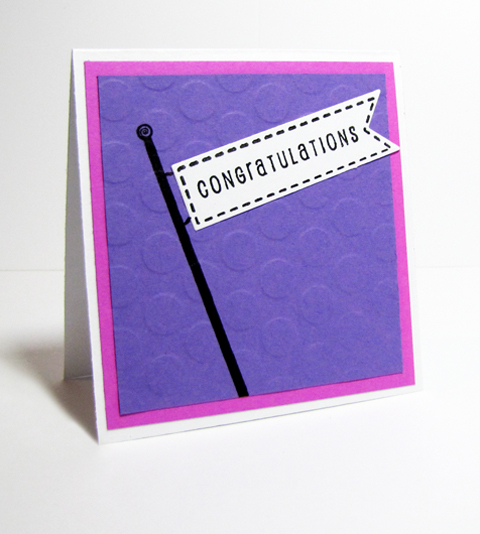 This card uses no patterned paper which is perfect for the Wee Memories Challenge. 1. First and Foremost, you can't get accepted unless you submit: Sometimes Submitting lives a normal life and walks hand and hand with Rejection. Just a matter of fact. 2. Don't take rejection personally: It could be that your card couldn't find its soul mate for the magazine in terms of color, style or product. Who knows, it just might find the love of its life in a future issue if you decide to give it the chance again! 3. Dare to be different: Perhaps Rejection decided to be an unwelcome house guest this month as it knew it'd be comfortable with the familiarity of design and product in your projects? Just had these thoughts in my running around in my head recently and decided to share them with you. 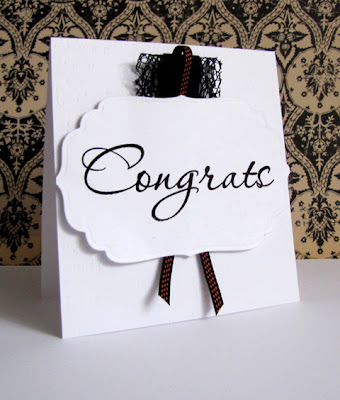 They don't really have anything to do with the cards...unless you received an acceptance email recently or gave your first go-round to the submission process-then Congratulations! Today marks the 20th Challenge at CAS-ual Fridays. Thank you, everyone, for making this such a great and go-to challenge site. We love to see your creations! 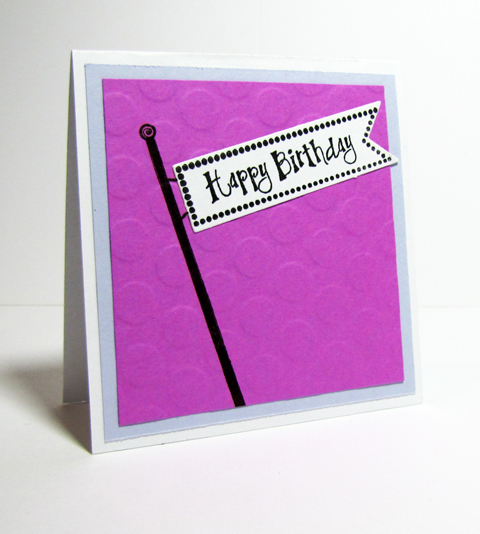 It's all about making mini cards this week and the fabulous sponsor is Annabelle Stamps. For more about the challenge, challenge rules, sponsor prizes and to see great inspiration from the Girl Fridays, mosey on over to the CAS-ual Fridays blog! For me, mini cards and card sets go hand in hand so that's what I've done here! I limited myself to work with one stamp set. It offered a variety of different sentiments that allowed me to keep the same design for an overall cohesive look. The size of each card measures 3.25 x 3.5 inches. 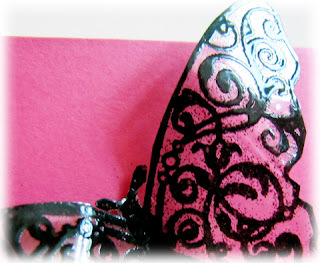 Cardstock: (White) Office Max, (Purples) Paper Co.
Over at the Skipping Stones Design blog I'm showcasing easy way to replicate the beauty of a butterfly in 3-D for a card, layout or home decor project. But, I can post it here too! The butterfly or even dragonfly in the Skipping Stones Design's set, Always Here, is a wonderful set to use for this technique because of their size and intricate details. You'll need just a few supplies and a few short steps to produce the stunning effects of a 3-D butterfly. Before stamping your image, wipe down a piece of acetate to prevent static cling of the powder (optional). 1. 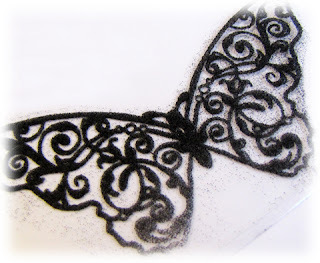 Stamp your image with watermark ink onto acetate, sprinkle with embossing powder. 2. 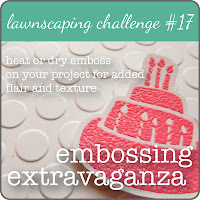 Remove excess powder with a small paintbrush. 3. 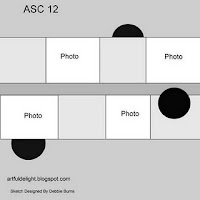 Heat your image from both sides of the acetate, moving your heating gun in small, rapid circles. 4. Trim your image and color on backside with marker, if desired. 6. 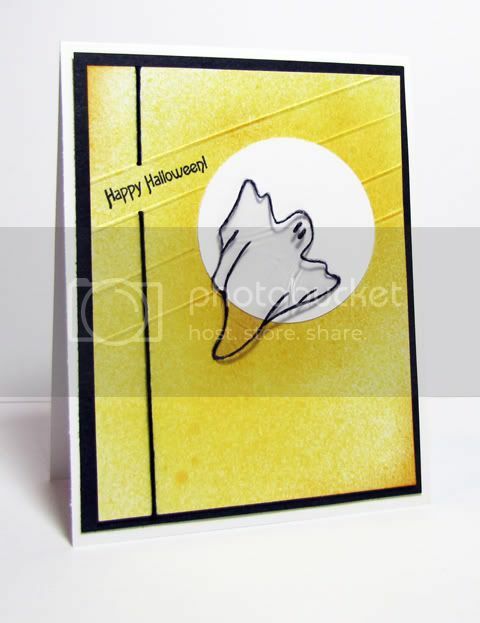 Adhere your 3-D piece onto a card with clear drying glue or a glue dot. 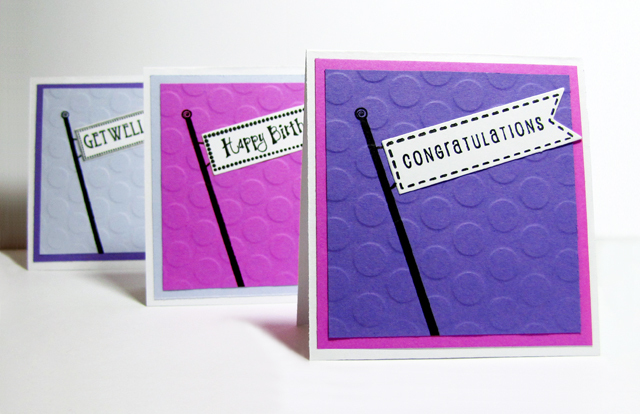 So easy and such a stunning effect with this particular stamp set! The colors for this project were influenced by the stunning combination over at CR84FN. and go whichever way I chanced to blow." Today Wendy P. from Paper, Ink and Smiles is joining me with a Carbon Copied project using Practicing Creativity Designs stamp set called You're Dandy and Moxie Fab World's Vertical Sketch Challenge. I've followed Wendy's amazing work for quite a while now and am delighted to share a spot next to her on the Skipping Stones Design Design Team. 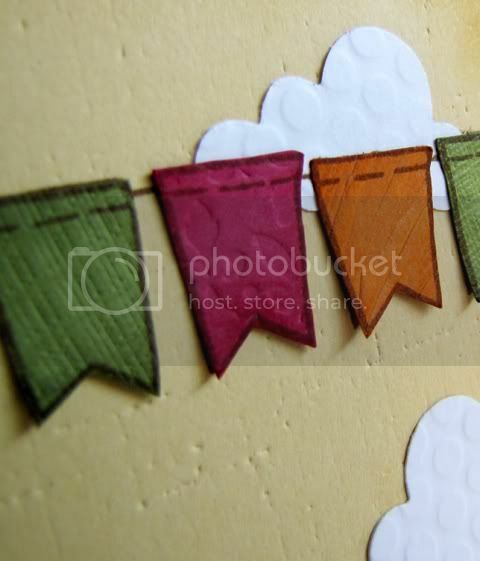 I've flipped the sketch upside down and paper pieced the kites. 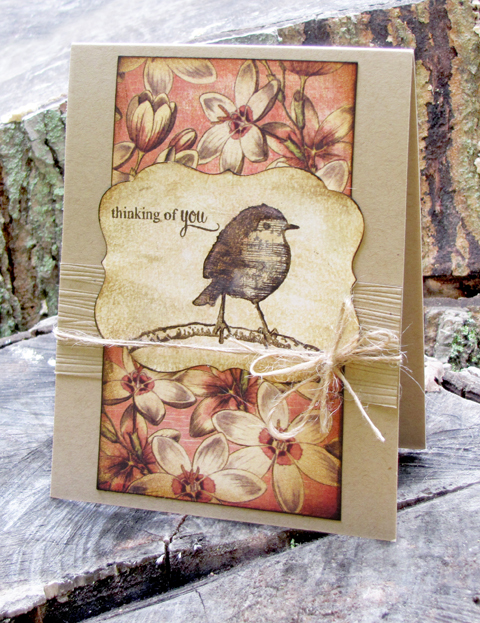 After inking all the edges of each piece of paper for a vintage inspired look, I adhered them all to a rustic card base. Simple, yes, but it brings back memories of the simple days when I was a kid and that is why I make cards. 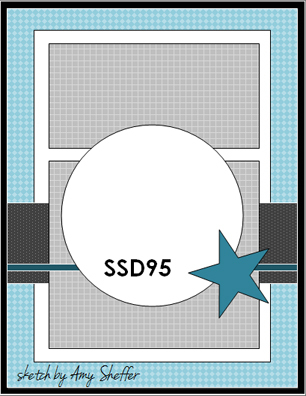 I remember now why I don't make cards the "normal Hallmark" way with the vertical orientation and the fold going down the side rather than the top-they are a bugger to photograph. My twin sister is a veterinarian, I've probably mentioned that oodles of times. I should say she is a great veterinarian...her suturing is very meticulous which makes pet owners very happy and the animals themselves heal quickly. She's doctored quite a few cats in her career so far, possibly even sutured a few noses, but I'm pretty positive that she hasn't ever used coral thread to stitch a nose! 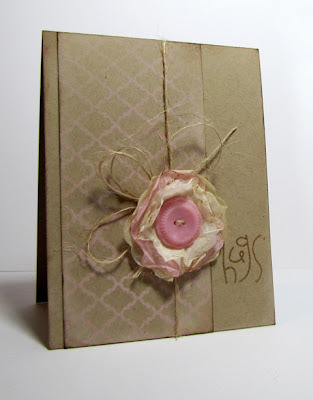 I studied the lovely blog of Amy, Skipping Stones Design's Sketch Artist for September to gather inspiration to create a shabby chic, vintage, multi-layered, highly distressed card for today's Skipping Stones Design Sketch Challenge #93 and Blog Hop. Skipping Stones Design is releasing the cutest of all cute cat stamps, Holiday Cats today! 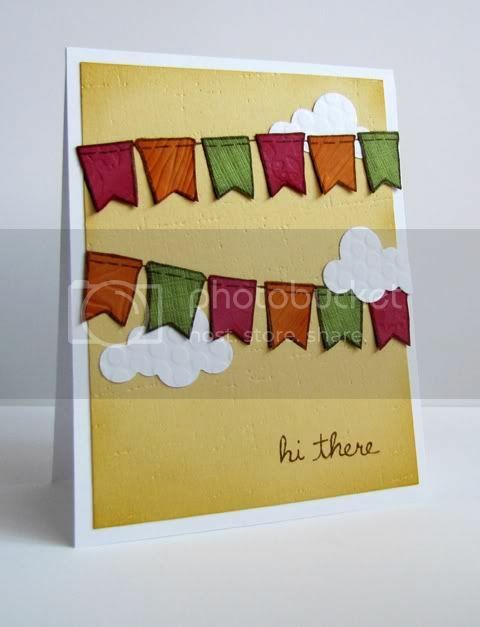 If you are following the hop, you should have arrived from the blog of the talented Amber. 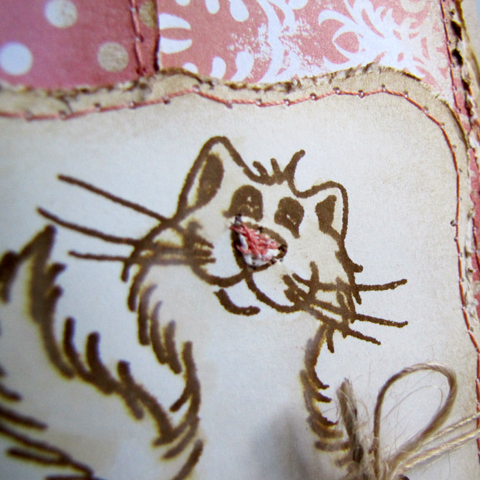 My kitty was first stamped in distress ink and then misted to soften and fuzzy up her fur. I then distressed all the panels, stitched all the panels and adhered them all to the card base after adding some ribbon and twine. definitely more manpower than I've ever put into a card in a long time but definitely like trying new things too. Oh, and I stitched her nose too, with the help of my boys pushing down the reverse button on the good ol' Janome. Sometimes it was a bit hard to see with their eager hands, but they were having a grand time and I didn't have the heart to interrupt them. I'm late in posting a winner of Skipping Stones Design's Grunge Stamp Set from August. 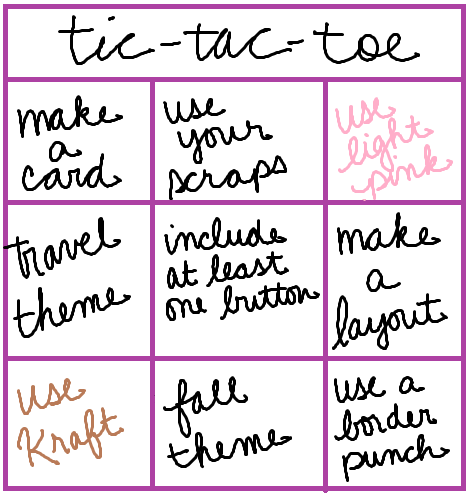 I had Chase, the younger boy, pick a number one through five, respectively for each Guest Design Post in August. He chose five, not sure why. Then I had Cole, the older boy, pick a number from one to 38, he chose 7, because he is seven. So, Erin T. you are the winner! 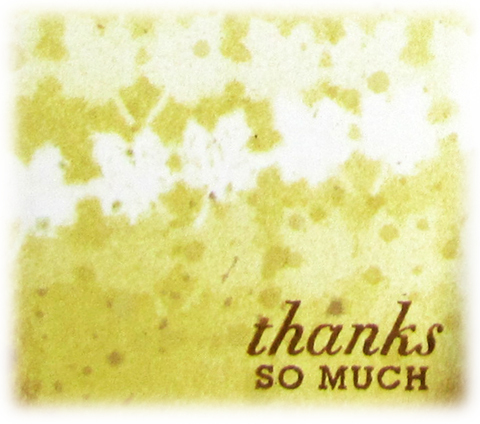 Edited to Add: the wonderfully talented Julie referred me to The Pink Elephant's Vintage Challenge. I don't delve into the world of vintage often, but I thought I'd give this challenge a go! Fear. Sadness. The unknown. I remember exactly where I was and what I was doing ten years ago today. I remember exactly what I felt the days to follow. And I remember the feeling I had the first time I heard the song above, as it summed up the entire experience for me. I remember. I'll never forget. So I'm confident today will end with much better memories. Thank you to the past heroes that perished, the heroes who helped then and now, and the future heroes that will continue to make the world a safe place. And today, I'm playing along with a number of challenge, they all helped define the design of one of my favorite cards to date! The Lawnscaping Challenge: Embossing Extravaganza: I pulled out just about every embossing folder I had to add texture to Lawn Fawn's Bannerific banners and PTI's clouds, as well as the background "sky." 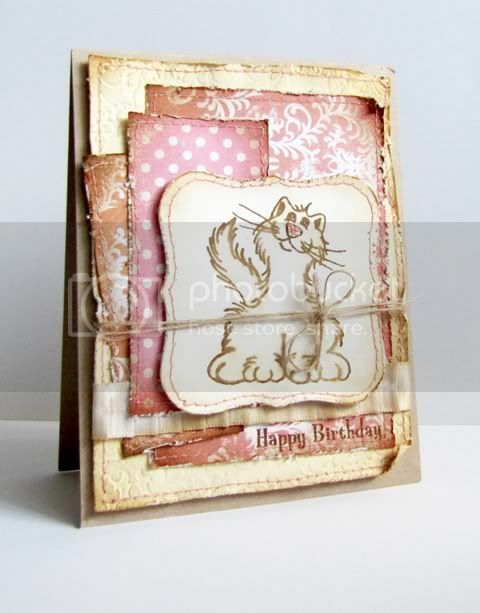 Artful Delight's Sketch Challenge: Its always fun for me to confirm a layout sketch to a card sketch. 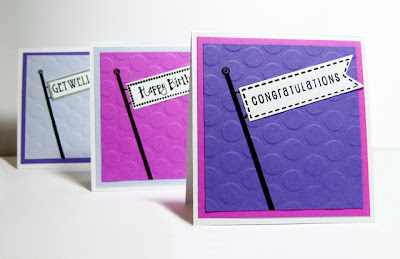 The Paper Variety's Blogoversary Challenge: Use Stamping.